The Victoria & Albert Museum has a wonderful collection of fashion plates available. This print was originally published in the June 1808 edition of La Belle Assemblee. The description provided is as follows: "Engraving with hand-colouring, showing three women in white high-waisted dresses walking together. The woman in the foreground wears yellow gloves and shoes, and has a fob hanging from her waist, and is wearing a flat straw hat tied on with a yellow scarf with a face veil. She holds a blue parasol by its ferule with the cover at the top. To the left is a woman in a puce spencer jacket with military-style braid details and matching puce turban, carrying a green parasol or reticule. To the right is a woman wearing a pale blue short-sleeved coat with a wrap front and short, cutaway skirt over her white dress. She wears elbow length white gloves, a straw hat and a long yellow scarf." The slim lines of the dresses accentuate the women's movements, which were governed by strict rules of etiquette. 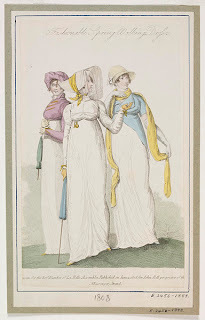 Promenading in public parks- dressed in the latest fashions, of course- was a popular pastime during the Regency era.